A salesperson driving to another city to make a presentation to a potential client. A university professor cycling across campus to talk to a colleague in another faculty. An administrative assistant walking a few blocks to pick up coffee for a meeting. Though they may not know it, all these people have two things in common. They’re all on the job and they’re all vulnerable to injury, even death. Motor vehicle collisions are the leading cause of workplace fatalities in Ontario, yet many organizations have paid little heed to preventing them. Wilfrid Laurier University’s department of Safety, Health, Environment and Risk Management (SHERM) is working to change that. En Route to Safety is a new free program aimed at Ontario businesses and organizations, particularly smaller ones without the resources for a formal health and safety program or dedicated safety officer. Created by SHERM with the input of many private- and public-sector partners from across the province, the program consists of a website, detailed guidebook and online training modules. 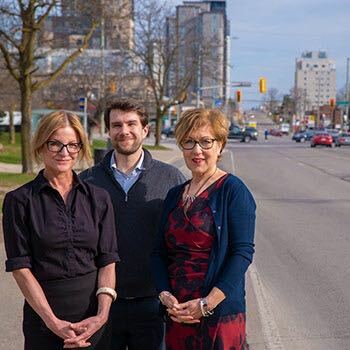 SHERM Director Stephanie Kibbee originally got the idea of creating a traffic and pedestrian safety program just for Laurier after she heard about such an initiative at Yale University. However, when she began her research more than two years ago, she realized how broad the need was in Ontario. Around the same time, Kibbee learned the Ontario Ministry of Labour had launched a competition for initiatives to promote occupational health and safety. SHERM applied and received nearly $200,000 in funding – the maximum – to create a program accessible to all. The program is unusual in addressing three modes of transportation – driving, walking and cycling. It’s customizable, with different workplaces able to concentrate on the modes of transportation their workers use most frequently. Importantly, the whole program is free, whereas comparable ones can cost hundreds of dollars per employee. Much of the content draws on external expertise. An advisory board that consisted of experts with police, industrial safety and professional driving backgrounds vetted the entire program. A variety of industry professionals from the public and private sectors gave input on the guidebook content. In many places, there are links to partner content, including videos. Employers interested in the program should start by reading the guidebook, which includes plenty of real-life examples, says Janet White Bardwell, communications specialist for the project. The three online training modules cover walking, cycling and driving, and each takes approximately 45 minutes to complete. Employers will be able to check which of their employees have completed which modules. “It’s an intuitive, simple system for an employer who doesn’t have a lot of time to manage training records,” says Good. SHERM will gather participant numbers for reporting purposes. The project’s goal is to reduce workplace motor vehicle collisions in Ontario. Laurier will maintain the program for at least three years, with in-course improvements possible based on feedback, says Kibbee. As for Laurier staff, whether to implement the program will be up to individual managers, but Kibbee hopes there will be broad uptake.